I have received several e-mails from potential buyers of Mike’s Mix who are concerned about the high level of “sugar” in the recovery drink. Mike’s Mix has a whopping 40 grams of sugar in each serving. I applaud these consumers for reading food and supplement labels with a critical eye and making efforts to avoid sugar in their diets. 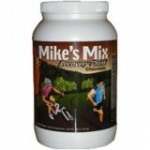 However, the composition of Mike’s Mix is ideal for promoting recovery after strenuous workouts. Its constituents have been well thought out and included only if required for optimal recovery. The composition of Mike’s Mix is designed in accordance with scientific research and will not be compromised to sell more products. I’m of course aware that I could sell a lot more Mike’s Mix if I offered a low-carbohydrate option or added artificial colors and sweeteners for taste. However, my emphasis is on providing the athlete with an effective, healthy and affordable product. I offer this brief discussion on sugars and why they are essential in recovery nutrition for those concerned with the sugar level in Mike’s Mix. The word sugar has at least three different uses. 1. Sugar is often used to describe the carbohydrate sucrose or “table sugar”; the sweet, white substance that you spoon into coffee. 3. Sugar is also included in the nutritional facts of food and supplement labels. The word sugar is used as an informal term to distinguish edible crystalline carbohydrates which include many mono and disaccharides. These sugars have a characteristic sweet flavor; High Fructose Corn Syrup, Lactose, Dextrose, Fructose, and Sucrose are the most common. In the remainder of this discussion “sugars” will be referring to this definition. Should you avoid Sugars in your Diet? Yes, at least most of the time. Sugar consumption is linked to weight gain, increased risk of diabetes, poor nutrition, and cardiovascular disease. For the most part, sugars are something you want to avoid in your diet. Dieters and those concerned about their health should go to great lengths to avoid added sugars. However, this can be a difficult task since sweeteners, such as high fructose corn syrup and sucrose, are ubiquitous in the human diet. It is rare to find a food or supplement that doesn’t include an abundance of these substances. The easiest advice for avoiding these added sugars is to stay away from foods that come in a box or a bag. Keep in mind that not all sugars are created equal. Sugars do occur naturally in nutritious foods such as fruits and dairy products 2. These foods have slow absorbing sugars and should be included in a well-balanced diet. Should there be Sugar in a Recovery Drink? High-glycemic carbohydrates (a carbohydrate that quickly is converted to glucose and made available for metabolism) are needed to replenish lost glycogen stores and to maximize the insulin response to assure optimal amino acid uptake into cells. Carbohydrate rich foods with a high-glycemic index should be the major constituent of recovery nutrition. 4 Dextrose (often referred to as glucose) has the highest glycemic index of any food and is a predominate ingredient in most quality recovery formulas. Dextrose is the major source of “sugar” in Mikes Mix. (There is also a little lactose from the whey protein and crystalline fructose, which is added for taste and to assure optimal hepatic glycogen synthesis). Maltodextrin, another carbohydrate, has a glycemic index similar to dextrose. However, maltodextrin is composed of chains of glucose molecules and is considered a complex carbohydrate and not classified as a sugar. Maltodextrin and Dextrose are the first two ingredients in Mike’s Mix and account for 70% of its calories. Beware of Low-glycemic Index Sugars in Recovery Supplements. Some sugars do not have a high-glycemic index value and are therefore not optimal for inclusion in an effective recovery drink. Fructose, sucrose and high-fructose corn syrup have low glycemic indexes and should not be one of the predominate ingredients in a recovery supplement. These sugars are sweet and cheap but are not as effective at replenishing glycogen as dextrose and maltodextrin. There are many manufacturers of recovery supplements. Some of the most popular do not adhere to science (although they claim to) but instead offer a product that appeals to the masses; sweet and colorful. If you are interested in optimizing your recovery take a good look at the ingredients. Dextrose (a sugar) and Maltodextrin (a complex carbohydrate) are two high-glycemic carbohydrates that should make up the majority of calories in a recovery formula. Mike’s Mix adheres to this formula and consequently is high in both sugars and calories. For optimal recovery, to replenish fuel and repair muscles, one must take in adequate nutrients, even when dieting. At all other times, especially if trying to lose weight, you should go out of your way to avoid added sugar. Crystalline fructose comes from corn most say its bad you say it comes from fruit is this true? Or is it just another way to hide hfcs? Fructose is present in nearly all fruits and vegetables and can be isolated into crystalline fructose (pure dried fructose) from almost any vegetable source. The crystalline fructose in Mike’s Mix is isolated from corn, simply because it is economical and easily obtained. However, crystalline fructose is a five carbon sugar that after isolation is identical regardless of the original source whether from corn, rice, apples, or eggplant. Crystalline fructose is not high fructose corn syrup (hfcs) which is made up of both glucose and fructose molecules. Your concern with crystalline fructose and hfcs is a growing trend among my customers and for good reason. The ubiquitous nature of sweeteners in the American diet including high-fructose corn-syrup, sucrose, and to a lesser degree crystalline fructose greatly contribute to this country’s growing obesity epidemic and the many chronic diseases related to this condition. However, there are no health concerns with the ingestion of small amounts of fructose (no more than eating an apple) and the benefits to the athlete in a post-workout meal warrant including fructose in the Mike’s Mix formula. Mike’s Mix contains only 5 grams of fructose per serving, which was not added to the formula to enhance flavor or add sweetness (although these are positive afterthoughts). There are only four ingredients in Original Mike’s Mix and each ingredient and its concentration was chosen strictly for its potential to aid an athlete in recovery from strenuous exercise. Fructose, which is almost entirely metabolized in the liver, yields a much higher repletion of liver glycogen than other forms of carbohydrate. http://www.ncbi.nlm.nih.gov/pubmed and small amounts of fructose in the presence of relatively high glucose levels (majority constituent of Mike’s Mix) markedly stimulate the enzyme responsible for glycogen formation. http://www.ncbi.nlm.nih.gov/pubmed/12199300 (Glycogen repletion is the top priority of athletes recovering from intense physical exercise). Hope this helps and if you have any more questions about the formula please feel free to ask. can i mix ,mike’s recovery drink with banana or other fruits? Yes, that’ s a great idea. Come summer I really crave a cold beverage after a workout. I often make a smoothie Mike’s Mix with frozen or fresh fruit. My favorite is bananas, cherries, strawberries, blackberries and pineapple. I have always used the original flavor for smoothies, but I have been wanting to try it with chocolate also.